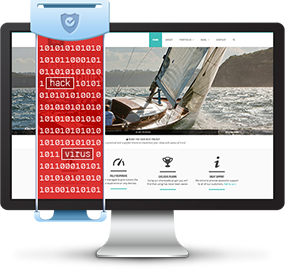 Site protection and site scanner identifies malware and security holes on your site that could allow a hacker to steal information, vandalize your site, infect your customers or be blacklisted with Google. Google constantly looks for websites with suspicious activity. If your website appears to be spreading malware or viruses Google will blacklist your site and it won't appear in any search results. Site Scanner checks for risks, and validates them to ensure they are real threats. This early warning system helps you steer clear of search engine blacklisting, saving your business's reputation and SEO positions. Our online security experts are there for you and your business 24 hours a day, seven days a week. Every day of the year. Bottom line - we've got your back.